Image size: 19"w x 28"h.
Image size: 27"w x 40"h.
Image size: 40"w x 59"h.
The Greenwich Workshop's second release from the iconic American painter John Trumbull is another cherished piece of American history. General George Washington at Trenton. In 1792 the city of Charleston, South Carolina, commissioned from John Trumbull a portrait of George Washington for its city hall to commemorate the president¹s visit the previous year. 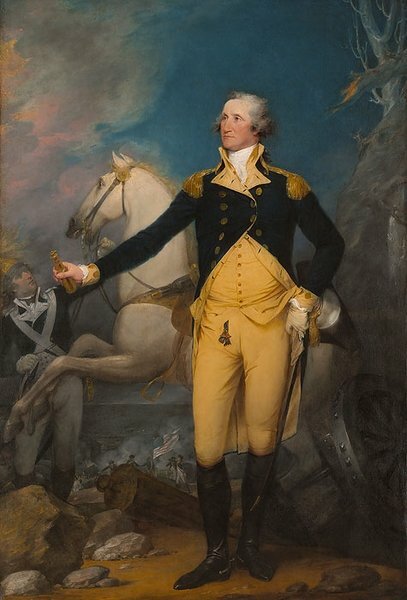 General Washington sat for Trumbull in Philadelphia in 1792, and this painting was the result. The commission had personal significance for Trumbull, for he had served as Washington¹s second aide-de-camp during the Revolution. Trumbull chose to convey the critical moment of Washington¹s leadership during the Revolutionary War when his night maneuvers at Trenton, New Jersey, led to a decisive victory at Princeton the following day, a major turning point of the war. Trumbull considered this portrait the "best of those which I painted." In Trumbull's blend of history painting and portrait, the commander in chief epitomizes heroism and nobility, yet Charleston refused to accept it on the grounds that they preferred a more amiable and peaceful image. Trumbull produced another likeness of Washington, this time with the city in the background, which Charleston accepted. The Greenwich Workshop is publishing the original version of the painting which hangs at The Yale University Art Gallery. This is the one that meant the most to the artist himself. In fact, John Trumbull's attachment to this specific painting is what led to a rather unusual request. The artist stipulated that upon his death his remains were to be interred close to this painting. That is why to this day the remains of both John Trumbull and his wife Sarah are kept safely within the walls of The Yale University Art Gallery. Directly beneath this very painting.